This Year We Are Celebrating LCCOA's 40th Anniversary!! Please Join Us For The Fun & Festivities! Funds raised benefit the Lincoln County Council on Aging (LCCOA) for the home delivered meals, and many other free programs. 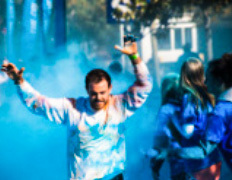 This unique run celebrates health and wellness, and was the first paint race in Lincoln County. Have the time of your life and help others while you do! This Color 5k is a great time for people of all ages. The Live Your Best Live Run will begin at 8am on Saturday, June 2nd. Pre-register online, or 7am registration at the event. Clonts Field; 41 Clonts Field Drive, Troy MO 63379. MORE ABOUT LCCOA: This year our organization celebrates 40 years of service! Lincoln County Council on Aging was incorporated in 1978 under the name of Troy Area Council on Aging. It was established to provide a meal program for persons 60 years of age and their spouses regardless of age on the basis of the Older Americans Act of Congress. We continue to operate in conjunction with the Area Agency on Aging. The agency has grown over the years to include all 642 square miles of the county. We have locations in Troy, Silex, Elsberry and Winfield. LCCOA delivers hot, nutritious meals to seniors, disabled, and Veterans, and serve in-center meals at all our locations Monday through Friday. We are ever evolving and constantly looking for ways that we can make positive impact in the lives of older adults, Veterans, and our community. Our slogan is "Live Your Best Life", and we provide many daily activities and free programs to help encourage active-aging. Evidence-based programs including the Diabetes Education & Empowerment Program, A Matter of Balance, Health Through Gardening, and CLAIM Certified Medicare Counseling are all free. We also have daily activities such as; exercise, quilting, bingo, the GR 323 Crossroad Cribbage Club, crafts, live music lunches & dinner dances, and movies. One of our most popular weekly events is Veterans Coffee Talk, every Thursday from 9-10:30am. Swag | ﻿T-shirt and goodie bag for all participants including color-powder-packet, freebies, and coupons of all sorts! Course | A very scenic route! The race begins at Clonts Field but goes down Boone Street, and back up Main Street. Awards | Fastest Male & Female - Ages 0-12, 13-19, 20-39, 40-59, 60+, the Fastest Overall Male 5k and the Fastest Overall Female 5k.